Marinate cleaned prawns with the ingredients given under marination for 30 minutes. Heat pan add ghee and add wholespices and some sliced onion and saute.Add cleaned drained rice to this and fry a bit and add 3 cups of water add required salt and add a drop of lemon juice and cook. Meanwhile heat oil in pan add a drop of ghee and oil saute onions for garnishing sprinkling salt till golden brown also add cashew and rasins and saute. In the same pan add some more oil and fry marinated prawns.Drain in tissue. To the same pan with oil add onion saute add ginger garlic paste and green chillies crushed and saute.Add the spice powders and little water and cook.Add fried prawns adjust salt and cook the masala. Also check if rice is ready.Take few strands of saffron in little warm milk. Grease a pan start layering.Add rice in pan then pour some saffron milk add little prawn masala and garnish again top up with rice masala saffron milk garnish cilantro. Now close the pan with an aluminium foil and then with lid. Heat in oven for 20 minutes. If on stove top heat for 15 minutes in low flame. 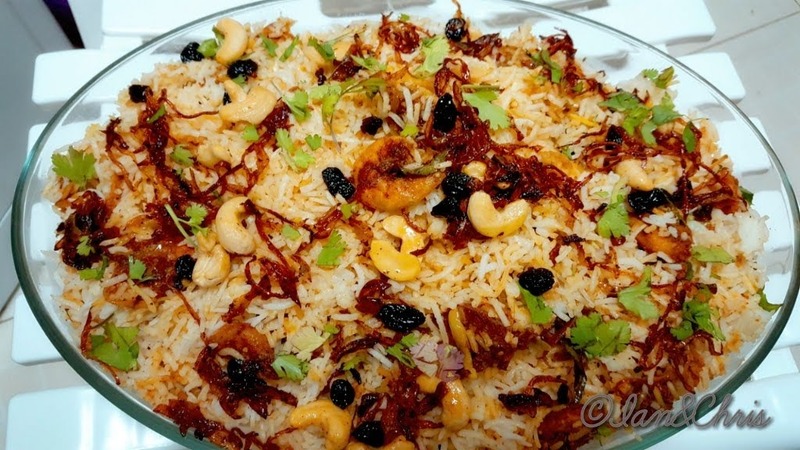 Serve hot.Your yummy Prawns dum biryani is ready.